Musha Bushido Dark Ninja Katana Sword | BUDK.com - Knives & Swords At The Lowest Prices! This Musha Bushido Dark Ninja Katana is your chance to own a battle-ready, full-tang katana at the fraction of the cost of most hand-made katana. 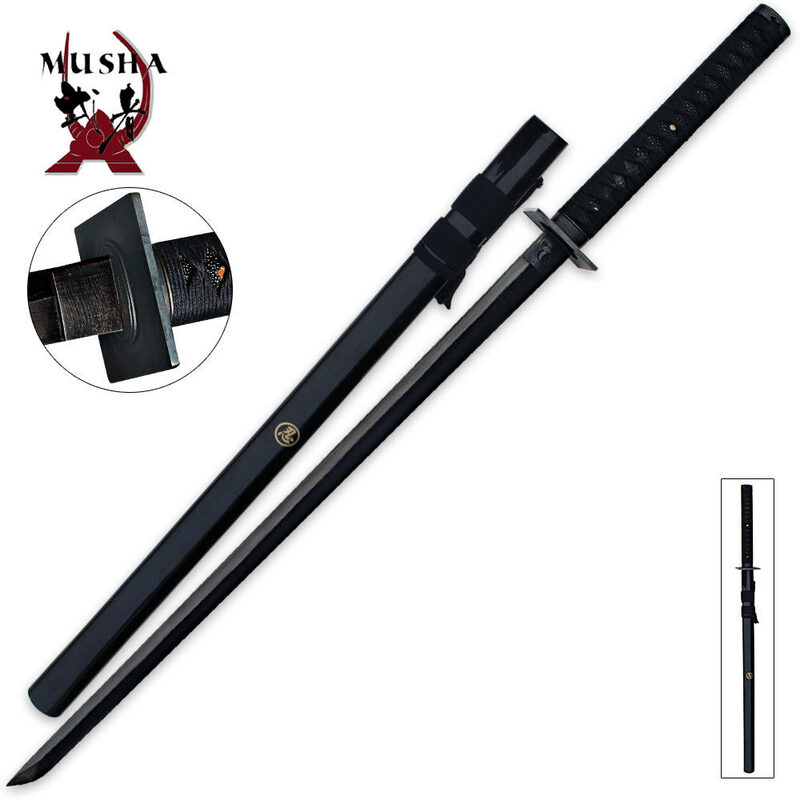 This all-black katana features a high-carbon steel blade that is razor sharp and full tang - attached to the hardwood handle with two bamboo pegs. The handle is wrapped in cotton cord in the traditional samurai wrapping pattern. Includes a hardwood blade scabbard for storing your new favorite sword. Even though to date there is no documented historical evidence in any museum or elsewhere supporting claims that the Ninja, a.k.a., Shinobi, ever used a sword with a straight blade and a square Tsuba, this sword is one of the most affordable, fully functional and accurate reproductions on the market that adheres to the public's uneducated perception of what a Ninja sword looks like. While the descriptions of the length of the Ninjato vary from some that are as short as a Wakizashi to those that were as long as a Katana, I chose one that was lengthy, similar to a Katana. This was strictly a personal choice. I also wanted one that was basic in design, not ornate or embellished in any way. This sword is as bare boned as they come without sacrificing its designed purpose as a weapon for cutting. Simplicity and effectiveness all played a role in my choice of choosing a Ninjato and since I never buy swords that aren't fully functional and I did intend on cutting with it, safety was a key factor, as well. I could have skimped out and bought a cheap stainless steel sword as an example for my collection, but anyone who knows anything about swords will agree that stainless steel swords are never meant to be swung and by no means ever safe to be used for cutting purposes. Another reason I wanted one was to compare its cutting and thrusting capabilities to that of the Samurai's Katana and Wakizashi design, which have been proven effective and evolved though hundreds of years of practicallity and aquiered knowledge. Upon first handling this sword out of the box, it was a little awkward, since I've had very little experience with a straight bladed sword. However, after familiarizing myself further with it and developing muscle memory from handling it, I found it to be quite comfortable. It cuts very smoothly with minimal movement to the target, which is ideal. As far as thrusting, it performs equally as well as a Katana since it has the same tip design (Kissaki). Overall, this Ninjato is a great sword for performing the demanding cutting techniques of Tameshigiri. Its fit and finish are impressive considering its minimal cost. The blade is very stiff, giving me the impression that it is thoroughly tempered, as advertized and I wouldn't hesitate to try it out on bamboo. The blade also tappers both in width and thickness from the Habaki to the Kissaki. Despite it having no Bo-hi, it's not as unbalanced as I originally thought it would be. The Ito is well wrapped and tight, as it should be. The Kashira, Fuchi, Menuki, both Seppa and Habaki appear to be made of the same cast metal material which I'm assuming is a zinc alloy. The Samegawa is jet black with a decent texture, but a bit softer than I've experienced before. The Saya came is nicely finished in glossy black and the Sageo came tightly tied in a common presentation knot, which I have untied for traditional use. I disassembled the entire sword before cutting with it, cleaned off a few burs from the Nakago, which to my surprise is 2/3's the length of the Nakago, making the sword truly "full tang". Stamped into one side of the Nakago is the word "SHINOBI" and the Musashi kanji engraved into the other side. I reamed out a few burs the Mekugi ana , replaced the Mekugi and all around fine tuned the entire piece. The Tsuka is consistant in shape, without any hourglass shape and arrived without any noticeable internal cracking. I also touched up the edge of the blade by stropping it on leather with a bit of Mother's Mag & Aluminum Polish, since it came a bit duller than I could accept. As an aside, the Tsuba on mine is not blackened solid copper as it was advertised, it is steel, since it is magnetic and in my opinion, more ideal than copper. Also, the blade is not anodized as it was advertised, rather, it is blued similar to so many firearms. As an avid Tameshigiri practitioner, retired Martial Artist and Japanese sword connoisseur, it is very important to me to try my hand at a variety of Japanese sword types, regardless whether they are or are not historically accurate. The sword is now displayed on a vertical display stand. Lyle D. Yates-Master Instructor. Very nice, when you get real ray skin , 1/4 inch 1045 carbon steel blued blade for 45 bucks, insane love it. I have spent 45 bucks back in the day,15 years ago and would get a thin 440stainless steel blade fake Ray skin fake leather wrap handle for 45 bucks still have the sword. No comparison. I HAVE 4 Musha swords, very happy with all of them. This is a better sword than I expected it when I bought it. It does not come razor sharp, but it is a great sword to have. at first I was pretty impressed with this sword out of the box, but after a few cutting tests, the steel isn't that strong. It will cut water bottles with ease after a little sharping. But when it came to cutting mats the blade started to bend after the third strike. All in all this sword LOOKS awesome, but that as far as it goes. Not really battle ready, but hey what do you expect for $45? Received this sword yesterday, and was blown away. I wasn't expecting this much quality for the price. It's a lil heavier than expected, not really that sharp, and the seppa(spacer) and habaki (blade collar) is loose, but if that's the only problem. I'll consider this a big win. Keep up the good work budk! If you're looking for a straight blade for practice, this may be the best fifty bucks you can spend. I bought this because I wanted to try some iaido forms with a straight-bladed weapon. I was pleasantly surprised at the build quality and solidity. Holds up quite well in full-speed forms; no rattling or looseness. Noto with a straight blade is... different. Easier in some ways, more difficult in others. This sword has a good enough balance, however, that experienced practitioners will pick it up quickly without too long of an adjustment period -- and you don't have to mortgage the house to give it a try. I've no idea of the "cutting power" of the blade; I do not waste my time on such childish behavior. Loved the first one so much had to get another!!! As always, True Swords had my sword to me 2 full days earlier than the "package tracking" stated. I have already purchased this sword once before. I love it so much i wanted another one just like it. Great sword. Love it and its "twin". i was NOT disappointed!!! True Swords is awesome. i highly recommend this sword. will probably be adding a few more of these to my collection. This was my first "normal" sword purchase. I also have Chinese hook swords, but those are so unconventional, they barely count. This sword is very nice, and the saya is equally well made. The tsuba is tight and solid, and the wrapping is uniform and snug. It's not razor sharp, but it did make some clean slices into some cardboard I had from another online purchase. I have to say, this sword is extremely heavy. I thought my hook swords were heavy and unbalanced, but this thing feels like a sharpened crowbar. Seriously, I'm afraid to swing it forcefully b/c I may injure myself joints or pull a muscle, and I'm not a little guy. It may be that swords are generally this weighty, and being my first real one, I just need to get used to it. No matter, it will look good on my weapons wall, which is where it was always intended to go anyways.